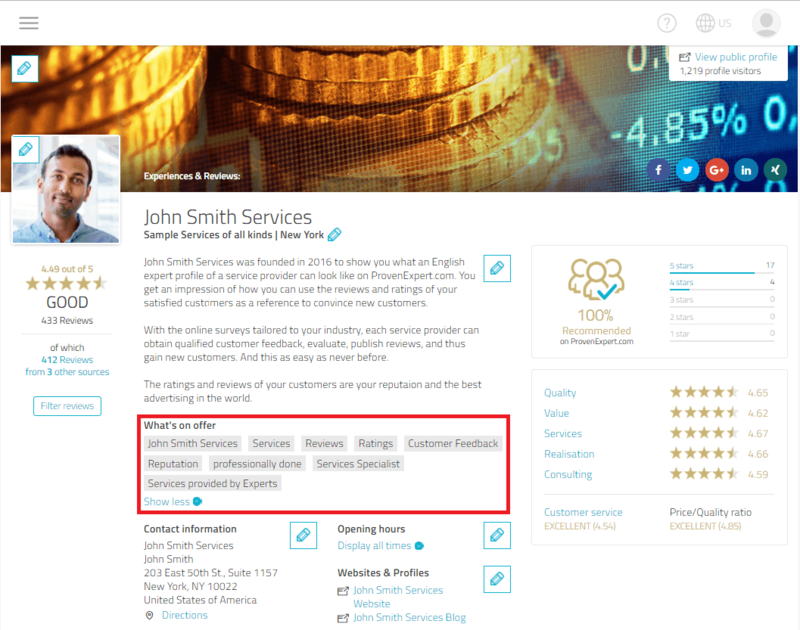 By creating a profile on ProvenExpert.com, you've taken the first important step towards enhanced visibility for your business online. But it's also important to know how to make your ProvenExpert profile work for you - by using the information and content that it contains to your advantage. „Keywords“ and „content“ are the magic words in SEO and hold a high value for online marketing. So - don't you use keywords and content automatically? Not necessarily: there are a certain aspects that need to be adhered to. We've compiled a short introduction for you with 7 useful tips for optimizing your profile. Search engines check all available websites for relevance to an individual search query. To make things quicker for the search engine user, Google algorithms and other search engine algorithms utilize a huge number of criteria in order to optimize search results further. This means that each piece of information on a website is collated with the search query: corresponding keywords, links, user traffic and, above all, your actual text content play key roles here. General ranking factors are hard to identify these days, due to the high dynamic of algorithms. And nobody wants to feature too low in rankings - so the question is, how can you optimize your profile for search machines? 1. Complete your whole review profile. Utilize each and every area of your profile that can be edited, because unfilled fields will not filter through to your search engine evaluation and and will be valued as irrelevant. A rule of thumb is that the more relevant information you provide, the more relevant your entire page will be for search engine results. Search engines can better identify contact data such as address, telephone and fax numbers, when the format is identical. For instance, the street name should always be displayed the same way either as „Main St. 123“ or „Main Street 123“ and country codes, hyphens and empty spaces should always be displayed the same way too. Create a unique statement describing what you offer. The exact text of the statement should not be repeated on your website, but it can be varied and replicated on your site at least once. 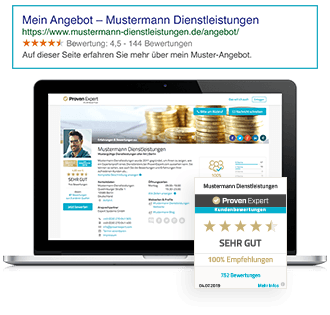 This enables you to avoid „duplicate content“, zu Deutsch „doppelte Inhalte“,which is also ascribed less value by search engines. The reason for this is that duplicate content poses a problem for search engines in that they must evaluate which website should place higher in rankings. Behind the text box „Offers“ should appear as no more and no less than a list of your services in keywords. The field is designed to contain keywords that are frequently searched for. If you offer your service on a regional basis, you may also find the city name below it, for example. The most optimal way to fill this field is to ask yourself what potential customers are typing in to their search engine in order to find you. Linking one website to another is a way of signalling to search engines that the linked website contains relevant content. The more often a link via other websites (your company website, Facebook page or partner website) leads to your ProvenExpert profile, the more valuable your profile is ranked by search engines. Be aware that any website that you link to is also checked for relevance, so don't link to just any old website! For social media, this aspect is intensified further because the possibility to share or link content holds even higher relevance. Each survey and evaluation you receive through the use of ProvenExpert comprises new, relevant content, since new data is added each time. That's why it's a good idea to make each survey specific in terms of the service you provided. For instance, a beauty salon can create separate surveys for facials and for pedicures or a car dealer could create separate surveys for garage repairs and for car sales. The more specific the focus of your survey, the more original the feedback from customers will be. Recent content also boosts relevance for your ranking in search results. The same applies to aggregated feedback from external review platforms like Facebook and Google. 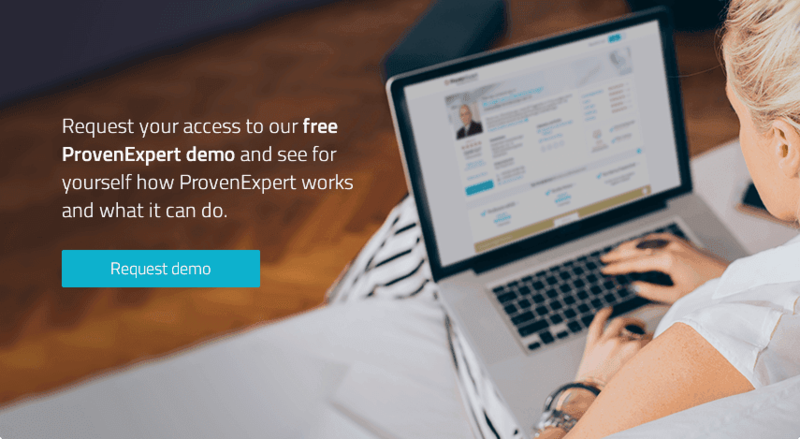 Despite the fact that only evaluation „figures“are transferred from external evaluation platforms, and not reviews with comments, your ProvenExpert profile can benefit from higher relevance as this content is more active and up to date. There's a lot to be said for uploading profile and header images. For one, profiles that don't feature an image appear not only unmaintained, but unprofessional. Aesthetically-pleasing images not only look good, but also fulfil perhaps the most important function in online marketing by giving profile visitors their first overall impression. That's why pixelated images should be avoided altogether. Profile images are also relevant for search engines. They're useful for image searches: the more images are linked to your company, your web and social media pages and your keywords, the more your profile images will appear in the search results. 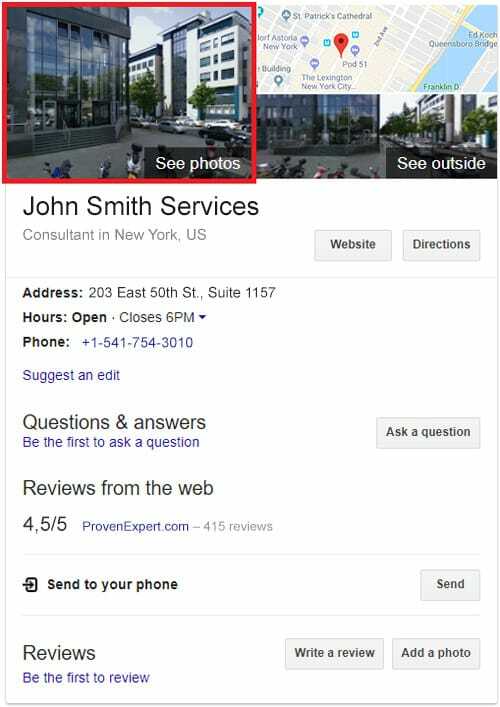 This of course also applies to images from other social networkers and Google users - for instance if someone uploads an image taken at your business location to Google and the image appears in the Google My Business Box – even without the image search. Tip:If you have qualified for one of our awards, in addition to a printed certificate and profile badge, you'll automatically receive an award badge, which you can display on your website for advertising purposes. This appears for associated keywords and keywords linked to your company under search results for the image search.